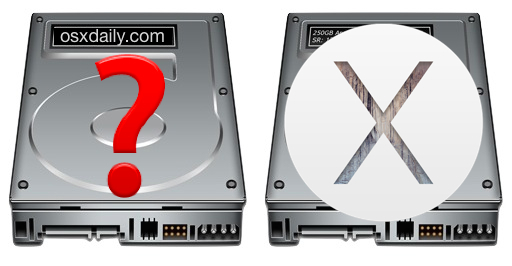 Some Mac users who partitioned their Macs to dual boot between the beta OS X Yosemite builds and stable OS X Mavericks releases have discovered a disconcerting issue; their Mavericks partition seems to have vanished and been replaced by an “OS X Installer” partition, forcing them to be stuck in OS X Yosemite. The obvious concern is that data loss occurred, but assuming you didn’t accidentally format the Mavericks drive, it has not, instead, the volume is just temporarily missing, having been taken over by the Yosemite Installer. Again, rebooting the Mac will now go into the volume you chose, whether Yosemite or Mavericks. Or you can use the Option key on boot to get the startup disk selection upon restart. Thanks to Phil for pointing this solution out in our comments! With whatever method, you should only need to do this action once to restore the “OS X Installer” partition to become the expected Mavericks “Macintosh HD” (or whatever your drive is named) partition. Again, after this has been completed, you can now regularly dual boot between OS X Yosemite and OS X Mavericks on their respective partitions as originally intended. 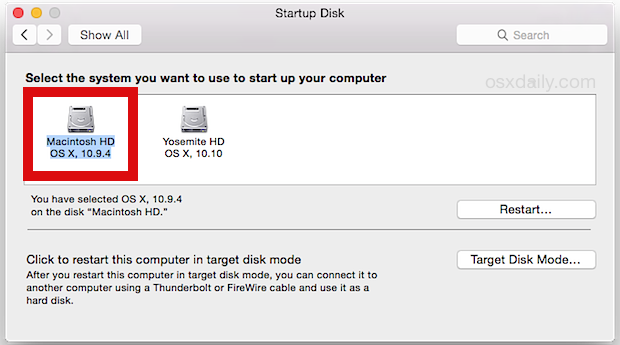 This issue seems to occur somewhat randomly and has not impacted all users, but it can happen whether Yosemite was installed from a USB boot drive or directly from the downloaded installer from the Applications folder. Obviously a bug, and that sort of thing comes with the territory given the OS X Yosemite Beta and Developer Preview builds are not final release software. Fortunately it’s easily resolved, so if you happen to encounter this issue, just rely on Startup Disk to quickly fix it. Find any other bugs or inconveniences with the beta build? Don’t forget to send feedback about Yosemite to help shape the future of OS X. What I have had happen is the Recovery Partition for 10.9 is gone. Where once there was one each for each of the OS’s that have a tag-a-long recovery partition. And in the beginning it was hard to tell which one was for which OS, besides their position in the line up, that did line with the order that the OS drives were. Once my 10.9 Recovery partition disappeared, the 10.10 Recovery was then labeled, Recovery-10.10. Now if they have consolidated both OS’s in to one Recovery partition that will recognize the OS and deal with it appropriately, that’s great. But nobody told me and marking it Recovery-10.10 would lead me to believe it’s exclusive. Could somebody please explain for those of us who are over 40? Yosemite doesn’t work right and I want it gone. Full stop. I don’t have a clue about “partitioning” etc. How do I make it go away and get back to basics? 1.) Backup your computer NOW before doing the following steps… so if the following steps don’t work, you haven’t lost your data. 2.) Restart your computer into Recovery Mode (hold down Command+R while your computer is restarting). 3.) On the next window that appears, select RESTORE FROM TIME MACHINE BACKUP. 4.) Obviously, choose your Mavericks backup in the next window that appears. 5.) Wait the 2 to 5 hours it will take to restore. Voila! You’re done. You will be upgraded back to your Mavericks. Hi I have exactly the same issue : my External Hard Drive that contains my Maverick clone is no more recognized after that installed Yosemite from it (Yosemite installer). Indeed, it’s still seen as “Installer OS” when I keep Alt button at the start, but no more as “Save SSD” which is its original name…. I did not do a Time Machine before upgrading to Yosemite nor do any back up since its a new mac and doesnt have any files yet and i will like to downgrade back because it doesn’t support YAHOO MESSENGER and its one of the best apps that i use alot.. please what can i do. it has happened to me when i was trying to install ML on external drive.